Queen Elizabeth II has achieved many incredible milestones as the reigning monarch, including being New Zealand’s and Britain’s longest-reigning monarch, being the longest-lived sovereign in history and being married longer than any other monarch. To pay tribute to Queen Elizabeth II, New Zealand Post is proud to issue a series of lenticular stamps that perfectly encapsulate the breadth and longevity of her life and reign as sovereign. Included in the issue are three stamps, housed within a unique miniature sheet. Each stamp contains three images - simply tilt the miniature sheet and watch the images change! The images take us from the Queen's christening in 1926 right through to her attendance at the 2015 Anzac commemorations in London. 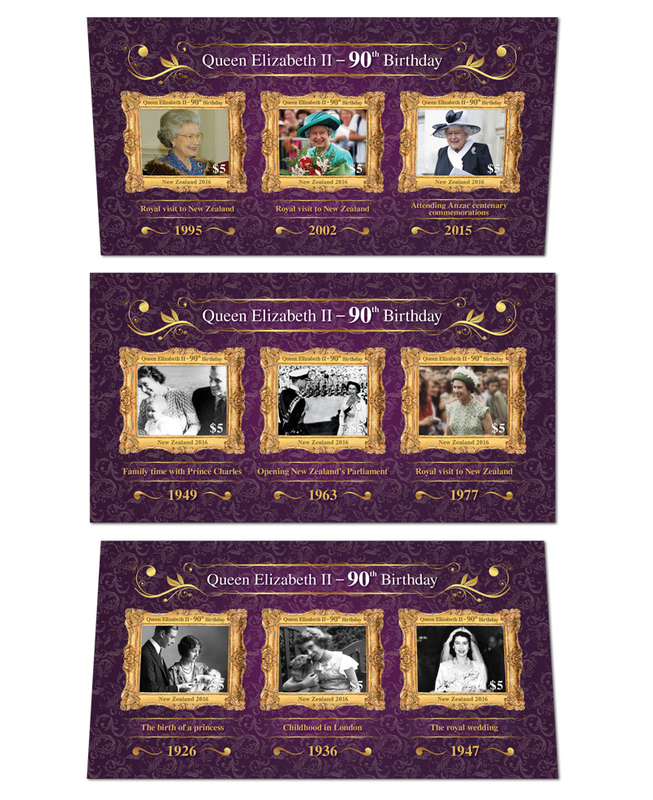 As you tilt the miniature sheet, the captions beneath the stamps change too - resulting in a comprehensive view of the Queen's lifetime. The stamps are featured in a classic stylised gold-gilded frame against a royal purple background, making this a truly regal stamp issue. No royal collection is complete without a first day cover, and the Queen's 90th birthday deserves something extra-special. This first day cover features the three lenticular stamps as well as a gorgeous photograph of Queen Elizabeth II as a baby from 1926. This collectable is a must-have for any royal enthusiast. 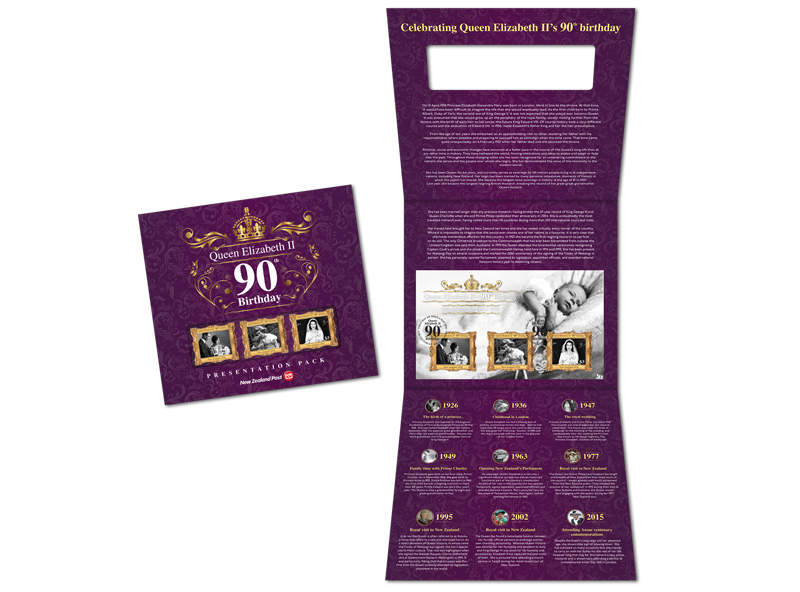 The premium collectable of this stamp issue, the Queen Elizabeth II - 90th Birthday presentation pack, includes the miniature sheet and the first day cover as well as in-depth information on Queen Elizabeth II’s life and reign written by Dr Sean Palmer, Chair of Monarchy New Zealand.